I woke up behind bars to the sound of sorrow and pain. My cell smelled rotten and vile, a bowl of green water in the corner. Next to it another rotten bowl of mush. I guessed that this was all I would have to eat for a while. Exhausted, I rested my head upon my paws, trying to ignore the continuous barks and howls, and instead remembering the peaceful memories of the past. 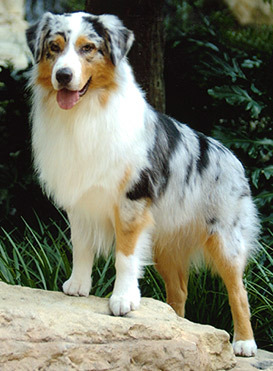 I was born a purebred Australian Shepherd and went by the name Sapphire. Both my parents and owners loved me very much. Everyday my favorite human Katherine would call the family to eat. She was an elderly woman, but she had the energy of a 6 year old. One day Katherine grew very I'll and unfortunately, she didn't make it. Her husband was still alive, but he didn't take care of us, and eventually my mother also died of starvation. It was that day that we ran away, my father and three siblings. Father eventually passed as we neared the first year. It was pretty sad times, but we were old enough to fend for ourselves. We traveled in a small pack and scavenged for the next year. That is when we get back to where I am now. I was once again jerked out of my dreams as the distinct sound of a door being unlocked silenceD all of the surrounding dogs. They all hid in the corners, as did I. The man walked in, picked up a frightened mutt and then walked away. Months had passed and I never saw that dog again, neither the next one, or the next one as they were taken into a room and replaced with new captives. It was near the end of winter when that specific someone came into my life. He looked to be around my age, and resembled a wolf. Constantly, as the keepers were dragging him in, he resisted and lashed at the two men. I watched in awe as they shoved him into a rusty cage, walking out of the pound with cuts all over. He looked quiet and quite lonely for the next hour or so, occasionally, he would pace around his small confinement as if waiting for something. At one of the times when he had stopped pacing, a man with a scar across his face and mouth full of rotten teeth stepped in. He opened my cage, tied a rope around my neck and dragged me out. It was time, time for me to go into the back room and never return like all the other dogs.